ATLANTA – Former Cal football player Tony Gonzalez was elected Saturday to the Pro Football Hall of Fame in his first year of eligibility. The announcement was made at The Fox Theatre during a taping of the NFL Honors television show that will air Saturday on CBS at 9 pm ET/PT. The tight end becomes the second former Cal football player in the esteemed Hall following the selection of the late Les Richter as a member of the Class of 2011. Gonzalez is joined in the Class of 2019 by Champ Bailey, Pat Bowlen, Gil Brandt, Ty Law, Kevin Mawae, Ed Reed and Johnny Robinson. "Tony Gonzalez is one of the greatest players in the history of the game," said Cal head coach Justin Wilcox, who is the son of Pro Football Hall of Famer Dave Wilcox (Class of 2000). "Our Cal community is honored that Tony is a Golden Bear and tremendously proud of him for joining one of the most elite groups in all of sports." The Class of 2019 will officially be enshrined into the Pro Football Hall of Fame on Aug. 3 at Tom Benson Hall of Fame Stadium in Canton, Ohio, during the Pro Football Hall of Fame Enshrinement Weekend that runs Aug. 1-4. 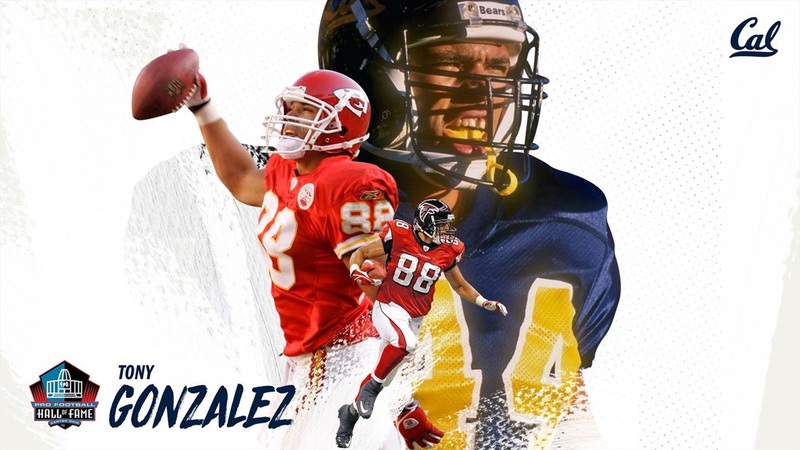 Gonzalez played three seasons at Cal (1994-96) before being selected by Kansas City in the first round of the 1997 NFL Draft. He spent the first 12 of his 17 NFL campaigns with the Chiefs (1997-2008) before finishing his professional football career by playing five seasons in Atlanta (2009-13). Below are notes on Gonzalez from his NFL and Cal careers.